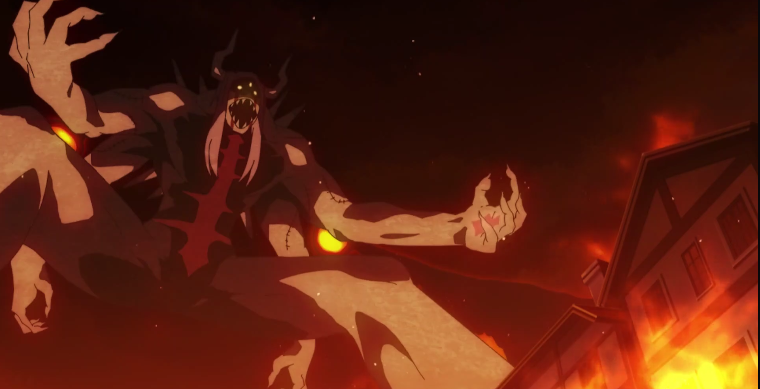 This episode begins with a quick flashback of the Wizard King saving humanity from a massive demon, in the present Asta and Yuno head to the Clover Kingdom for the exam for joining the magic knights. Asta marvels at the offerings that the village shops have. Meanwhile, at the church Nash is enjoying his time without loudmouth Asta, but he does hope that they both succeed in passing the exam. They arrive and sign their grimoire in and receive their numbers. While in the square the participants are surrounded by birds called “anti-birds,” according to one participant the lower your magic is the more birds that surround you. Unsurprisingly, Yuno has no bird around him and Asta is surrounded by a flock. While he’s flailing about he runs into a big guy named, Yami Sukehiro. 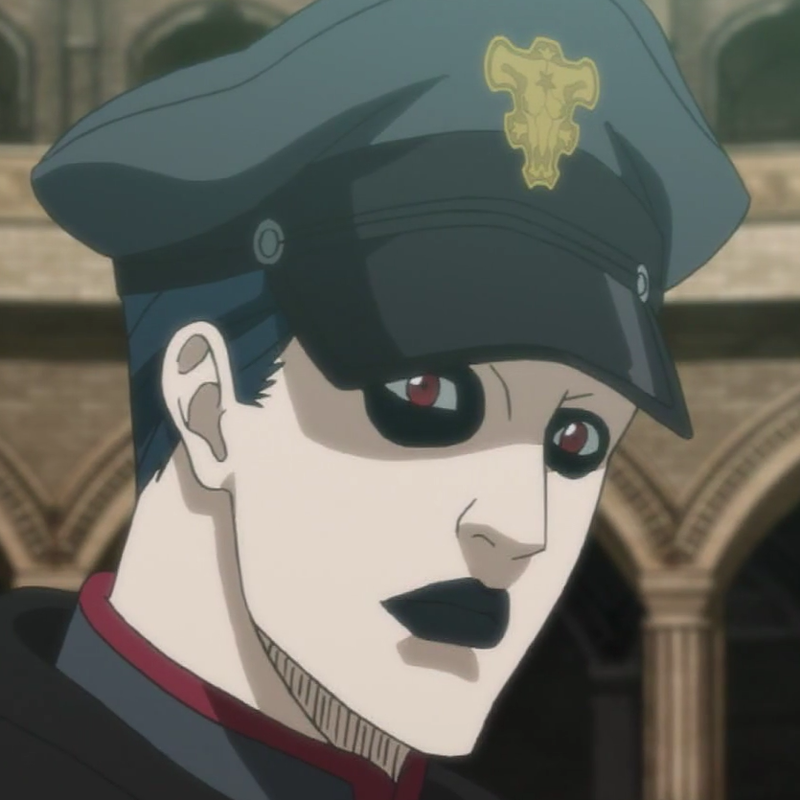 He’s the Captain of Clover Kingdom’s Black Bull squad. We are also introduced to two other members Gordon Agrippa, and Finral Roulacase. 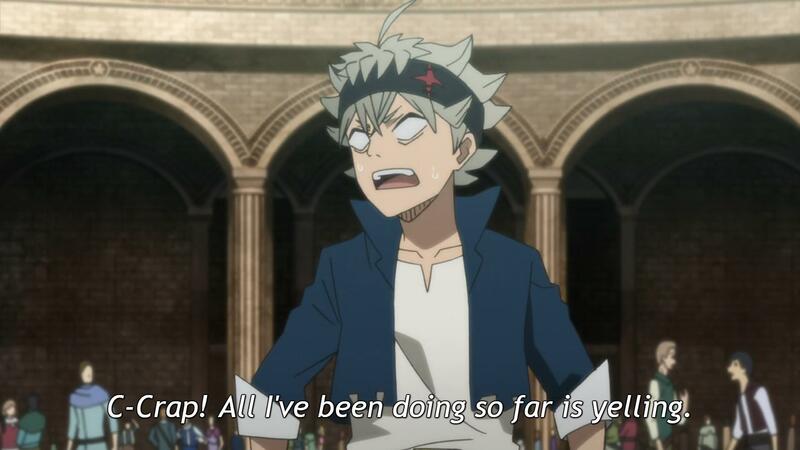 As Yami is crushing Asta’s skull the bell rings signally the beginning of exam. We are also introduced to several other squad Captains, Nozel Silva, Captain of the Silver Eagles, Fuegoleon Vermillion the Captain of the Crimson Lion Kings, Jack the Ripper, Green Praying Mantises Captain, Charlotte Roselei, Captain of the Blue Rose Knights. There’s Gueldre Poizot, Purple Orcas Captain, Coral Peacocks Captain Dorothy Unsworth, who’s always asleep, 19 year old Rill Boismortier, Aqua Deer Captain, and finally Golden Dawn Captain, William Vangeance. Golden Dawn is considered to be the top squad, the strength of a squad Captain is said to equal that of 100 mages. William begins the exam by calling forth a magic tree that gives the participants broom sticks. Each Captain is going to judge and choose the mage they want, if more than choose the participant then they decided which squad they prefer. The first task for the mages is to fly on the broom stick. Predictably, Asta can’t do it at all, he also fails the “magic power test,” “magic power control test,” “creation magic test,” “evolution magic test.” Sekke Bronzazza who up until this point was “helping” Asta turns on him and tries to use his “weakness” to gain a easy win. 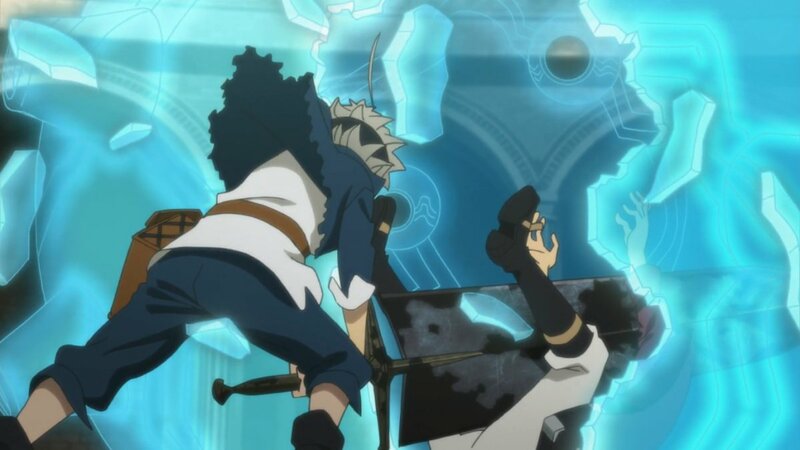 Sekke uses his grimoire to create a blue wrecking ball that surrounds himself, however, Asta uses his and easily KO’s him with a devastating attack. 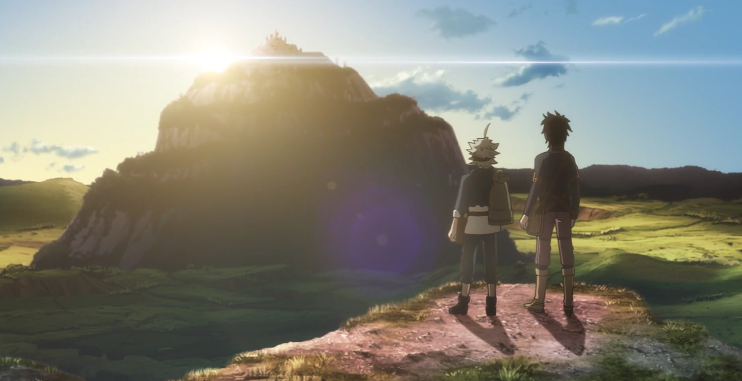 While this episode was completely predictable I still enjoyed it, I’ll go on a limb and assume that Asta joins the Black Bull squad and Yuno joins the “best” squad, Golden Dawn. They seem that they’re the most appropriate squads for each. I wonder if Asta will accept the fact that he has no magic power, so far he’s been given explicit evidence that he has none, with the chains that sense magic from the first episode, the birds in this one and the fact that he’s NEVER used any magic. I’m hoping he get it eventually. 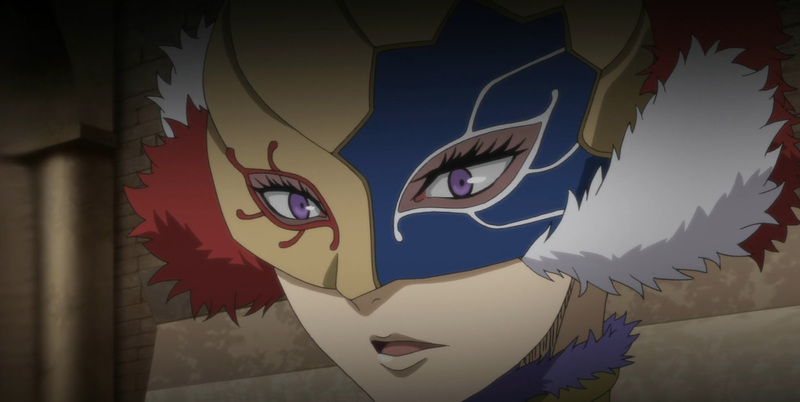 Finally, learning the names of characters can be a chore at the beginning of any series but some of the Captain names are a mouthful, specifically, Finral Roulacase and Fuegoleon Vermillion. I also find Asta less annoying and I’m actively rooting for him, so progress.